Weight: Wide variation. But usually 8 kg (18 lb). 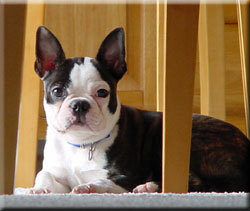 The Boston Terrier is even-tempered, intelligent, gentle and lively. Boston Terriers are playful and affectionate with their owners. They are good with children who can appreciate their clown-like antics. Boston Terriers are intelligent and quick to learn, making obedience training easy and straighforward. The Boston Terrier is strong-willed and boisterous, but they make a thoroughly good-natured family dog. Grooming is minimal with the Boston Terrier. Occasionally run a brush or smooth glove over the coat and keep the ears clean and claws trimmed. The facial creases may need some attention from time to time with a special lotion for this area. Exercise for Boston Terriers is undemanding. They have no desire for long walks, but do like to go with their owner/family everywhere. They enjoy playing. Boston Terriers evolved from cross-breeding in America between Bulldogs and Bull Terriers. They were once known as the American Bull Terrier. Their name was changed to Boston Terrier in order to seperate them from the already established Bull Terrier. The name 'Boston Terrier' was in honour of the city where their breed type was first developed. The progenitors of this breed weighed as much as 27kg (60lb), while today one sees the Boston Terrier around 6.8kg with a limit of up to 11.4kg. There are associated problems with Boston Terriers including inherited eye conditions and their eyes are more prone to injuries. However these difficulties are now less of a problem than in the past. Boston Terriers also tend to snore loudly and have regular flatulence. Sometimes natural births of this breed are impossible, due to the large head size of the puppies. Therefore caesarian sections are quite common for delivery Boston Terriers.